Published: Jun 26, 2016 to ? 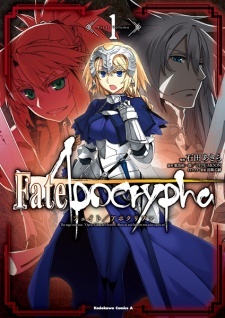 The setting of Fate/Apocrypha is a parallel world to Fate/stay night where the Greater Grail was removed from Fuyuki after the Third Holy Grail War and disappeared for many years. Around the 2000s, around the same time as the Fifth Holy Grail War would have happened, the group that plundered the Grail, Yggdmillennia, openly declares their secession from the Mage's Association and that they are in possession of the Grail. The Association dispatches fifty magi to retrieve it, but all but one are instantly slaughtered by Lancer of Black. The one remaining manages to activate the reserve system of the Greater Grail, allowing for the summoning of fourteen Servants in total. This marks the start of the Great Holy Grail War in Trifas, featuring two different factions, the Black Faction, whose members are part of Yggdramillennia, and the Red Faction, whose members were sent by the Mage's Association with the exception of one from the Church. The Grail itself also summons Ruler to act as a mediator of the Holy Grail War. Following a 2016 animated feature, mobile game Fate/Grand Order is set to be adapted into a live stage play in July of 2017. Oy Vey! 10+ Jewish Characters in Anime! The Jewish population in Japan may be tiny (IT'S UNDER 9000! ), but there's a long history of exchange between Jewish and Japanese culture. Here's some historical background and a list of stand-out Jewish characters in anime, manga, and light novels.